SCRIPTURE STUDY: Luke 13:1-9, Resisting the bottom line, for what else is there for us to do? Let me start by saying that I find Luke 13:1-9 problematic. What we’ll hear this Sunday—what we hear whenever it is preached on—is that repentance is the theme of the passage. Which, I’ll agree, Luke has shaped it to be for this intent. But I can’t help but wonder if there are other things going on in the passage which go unnoticed and which might be begging for deeper reflection. The intended audience to whom Jesus is speaking seems to fluctuate between the general (the crowd) and the specific (his disciples, opponents), without it being clear immediately to whom his words are directed. Jesus’ words throughout chapter 12, even when he is offering reassurance, are difficult and blunt, encompassing persecution, loss of possessions, warnings, judgment, division, death, and conflict. The first characters introduced in v. 1 are “some people” who tell Jesus a story about some “Galileans” who were killed by Pilate while on the Temple grounds preparing their sacrifices for worship. The identity of “some people” is not otherwise specified but we can get some clues as to who they are and what their intentions are through their own words and then Jesus’ response to them in v. 2. The fact that they are speaking of “Galileans” probably signifies that they are NOT Galileans. The harshness of Jesus’ response toward them should signal to us that their disposition in sharing the story is not a positive one; Jesus pulls back the curtain on what is behind the seemingly innocuous story—their assertion that the viciousness and suddenness of the deaths of these Galileans speaks to their deep sinfulness. There is a current throughout Scripture and Israelite religion that associates suffering with personal sinfulness (think Job or the story in John’s gospel about the man born blind). But rather than answer the question, Jesus redirects their concern with the sinfulness of others to their own sinfulness in v. 3: “But I tell you, if you do not repent, you will all perish as they did!” Rather than engage in an argument about the relative sinfulness of the actions of others, Jesus seems to be suggesting to his questioners (as well as all those present and us as readers) that what we ought to be concerned about is our own sinfulness and get about the work of acknowledging and dealing with that. And lest his questioners get any kick out of pointing out the fallenness of Jesus’ fellow Galileans, in v. 4-5 he reminds them of the disaster that caused the deaths of 18 Jerusalemites (maybe because his questioners are also Jerusalemites? ), before quickly also redirecting his listeners from the failures of others to their own need for repentance. I think Luke also is giving us a little background on Pilate and foreshadowing of what is to come. I’m sure it wasn’t lost on Jesus or the crowds that Pilate is presented here as killing Galileans; maybe even part of the reason for telling this particular story to Jesus is to remind him what he has to look forward to as a Galilean. But the story also makes sure we are aware of the brutality of Pilate, his disregard for the religion and culture of the people over whom he rules (killing the Galileans in the Temple as they are preparing to offer sacrifice), and his predisposition to employing extreme violence to solve issues. We shouldn’t therefore mistake his reluctance to crucify Jesus later in Luke’s gospel as a commentary on what kind of man Pilate was, or an apologetic seeking to “wash the hands” of the Romans for their complicity in Jesus’ death. Pilate’s reluctance isn’t about Pilate; it’s about Jesus and his innocence. And for all his claims about finding Jesus innocent, Pilate goes right along with the execution after all is said and done. Luke then employs a parable about a fig tree, a landowner and a gardener, choosing it for the purpose of demonstrating the theme of the previous exchange—repentance. What we typically take from this parable is the warning that like this tree which does not bear fruit, our repentance must be followed by “bearing good fruit,” lest the landowner (God?) decide to cut us down. We can see how Luke connects the passage to Jesus’ call for repentance. In chapter three, Luke has John the Baptist preaching repentance and using the metaphor that those coming to him for baptism must “produce good fruits as evidence of your repentance” otherwise they will be “cut down and thrown into the fire.” John the Baptist is all over Luke 13:1-9! But let’s look at what the parable might have signified separate from Luke’s theme of repentance and bearing good fruit. We have a man who owns an orchard, i.e. a landowner, and an absentee landowner at that (the meaning of coming for three years looking for fruit is that he comes only at harvest time, from somewhere else). We can also glean that he is not the one who takes care of the orchard or this particular fig tree. He has hired help, a gardener/vinedresser, for that—the second character in the story. What is also evident is that the main concern of the landowner is the bottom line: this tree produces no fruit, it puts no money in his pocket, it is simply “wasting space” as he explains in other words. Those in the crowd would have found this absentee landowner to be a familiar figure; many of them would have possibly been employed by someone just like him, working to tend his orchard and seeing all of their work go to benefit his bank account. This upcoming Sunday’s gospel reading is from Luke, chapter 9, verses 28-36, the transfiguration episode. Immediately when we begin the passage in v. 28, “after he (Jesus) said this,” a notation that should spell out that this episode is connected to and to be understood in relation to the passage that just preceded it. So what was it that Jesus just said? In 9:22-27 Jesus predicts his suffering and death at the hands of the religious authorities and lays out some hard words about what is in store for those who will follow him: denial of one’s self, taking up the Cross, losing one’s life, and so on. His words to his disciples and other would-be followers come on the heel of Peter’s announcement that he is “the Christ of God,” the Messiah—a term fraught with cultural, political and religious baggage that all point to a Messiah who is like David was, i.e. a warrior-king. Jesus’ words in 22-27 are the beginning of his work to undermine the traditional understanding of Messiah and craft a new one. So we have Jesus, with three of his disciples, ascending a mountain to pray in v. 28. The setting on a mountain should conjure up for us memories of other important events and figures related to ascending a mountain—not the least being the Exodus story, Moses and his various encounters with God. Throughout Scripture, the mountain is an “in-between space,” rising up from what happens below in ordinary life toward the skies and the realm of heaven. In Luke it functions here as a place of revelation, but also a setting for prayer. And for both these reasons, as well as additional ones, it is a contrast to the Jerusalem Temple, a different sort of place for prayer and revelation. It is interesting that the whole following scene unfolds on the mountain, perhaps purposely chosen as a contrast to the Temple where God’s presence was “officially” supposed to reside, amidst the official authorities and the cultic system and the economics of sacrifice. On the mountain, Jesus is joined by and converses with Moses and Elijah. The question for us is why these two? Why not David? Or any of the patriarchs? Jesus’ association with these two should give us a clue as to which tradition Jesus stands in within the Judaism of his day. He doesn’t stand in the tradition of David the warrior-king, the quintessential Messiah figure, but rather with Moses—the liberator of slaves and opponent of Pharaoh and the Egyptian empire—and Elijah—the prophet par excellence who challenges the Israelite King Ahab and his Queen Jezebel over their greed and injustice. Like these two, Jesus in Luke’s gospel will be cast as one who challenges the powerful. As Moses and Elijah begin to depart, the disciples awake, glimpse what is going on, but as Luke tells us in v. 33 in reference specifically to Peter, “he did not know what he was talking about.” Peter has misgauged what is happening and his attempt to “capture” the moment by erecting three tents or booths to memorialize the episode is emphatically shot down in the most ominous way possible: a voice from a cloud interrupts his nonsense in v. 34. The voice speaks in a way that should recall the earlier passage after Jesus’ baptism, the revelation that he was God’s beloved son—a revelation that sent Jesus off into the wilderness to figure out exactly what that means (click here to read our reflection on that passage from last week). The voice this time speaks not to Jesus, but to the disciples: “This is my chosen Son! Listen to him!” The exclamation points belong to the passage, because the voice here speaks with power and emphasis. And it is the second part of what the voice says that catapults us back again to what Jesus said just prior to this passage in vs. 22-27, taking us full circle. Listen to him. Don’t get caught up in your tent-building Peter, or building statues or monuments, or tabernacles or worship. Don’t get excited about Jesus being the new David, ready to kick the Romans out and set up a new monarchy. Don’t get lured in by the miracles and healings. The important thing here is to listen to him. Pay attention to what he says, and then go live it. So difficult for the disciples then; difficult for those of us who call ourselves followers of him now. Do we really listen to Jesus? Do we take his words to heart and stand in that tradition with him, Moses and Elijah, speaking truth to power and advocating in behalf of the poor, oppressed, downtrodden and marginalized? The verse ends with the disciples doing that first action that might lead to listening to him. They fall silent. And as the road turns toward Jerusalem for them and for Jesus, maybe we’ll fall silent too and start listening. 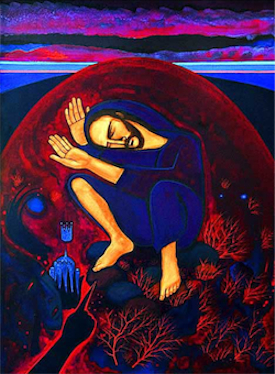 We began our Lenten Scripture study last Wednesday with the gospel reading for yesterday, the First Sunday of Lent: Luke 4:1-13, the temptation narrative. We started by first noting the context of the passage in Luke’s gospel, particularly paying attention to the action which occurs just prior—the baptism of Jesus at the Jordan, followed by this revelation: “… heaven was opened and the holy Spirit descended upon him in bodily form like a dove. 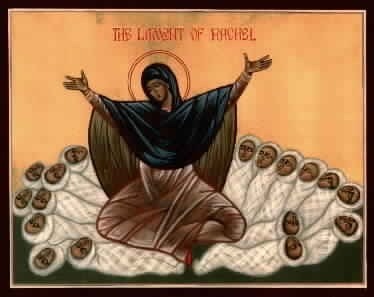 And a voice came from heaven, ‘You are my beloved son; with you I am well pleased’” (3:22). We noted that this scene sets up the temptation narrative; that before the baptism and the voice from heaven—with the exception of the infancy narrative in Luke—Jesus is seemingly a normal, ordinary Jewish man from Nazareth. But upon being baptized, Jesus experiences something extraordinary, something which propels him not back home but further into the desert/wilderness, and this time, on his own. The “voice from heaven” initiates an abrupt and serious change in Jesus’ life, and begs the question: What does this mean to be the “beloved son”? So we pick up the story in 4:1 and the overtones of the Exodus story are apparent almost immediately: Jesus is led, like the Israelites following their liberation from Egypt, into the desert, for forty days (with the forty days for Jesus equaling the forty years the Israelites wandered in the desert/wilderness). In the Exodus story, the Israelites, just recently freed from slavery in Egypt, will begin to complain, longing for a return to Egypt and the oppression of the Pharaoh where at least they had food to fill their bellies. Such complaints and grumbling will eventually lead to idolatry, marking the Israelites 40 years as a time of struggle and repeated detours into faithlessness. The question arises for us: Will Jesus, the chosen person (beloved son) fare any better during the time of trial than God’s chosen people did during the Exodus? What does it mean to be the beloved son of God? It is upon the seemingly subtle word “If” in verse 3 that the purpose of the passage first turns. Following the voice from heaven proclaiming him “the beloved son”, Jesus must have found himself in the position of trying to make sense of what that meant for him and for his life from this point forward. We might even see the solitary sojourn into the desert as a type of “vision quest,” a searching for answers and an attempt to integrate some extraordinary new knowledge or experience that means never being the same again. So just as Jesus is wrestling with what it means that he has been named the beloved son of God, along comes the Tempter teasing that very question with a quick and easy way to confirm the experience: Do a magic trick. Turn the stone into bread. Jesus, having not eaten for 40 days and certainly famished, might have seen such a suggestion as no big deal—it doesn’t hurt anyone, there is no maliciousness in it, and he is in need of food. Why not take care of two of his most pressing needs at one time: feed his hunger and see if there is any power behind this revelation that he has received about himself. Jesus’ refusal to do just this should give us a clue as to what being a “child of God” is not about: it is not about using one’s power to fulfill one’s own needs, putting God at the service of one’s self. But it is the second temptation that is really striking. In verse 5-6 the devil shows Jesus all of the world’s kingdoms and offers them to Jesus, with the boast that power and glory of all of these kingdoms has been “handed over to me, and I may give it to whomever I wish.” The only requirement is that Jesus worship the devil, which of course, he refuses in verse 8. But it is that boast of the devil—that it is not God but rather the devil who doles out power to those in charge of running the great kingdoms and empires of the world, and which goes seemingly unchallenged by Jesus as if it is of course a matter of simple fact—which should stop us in our tracks. The author of Luke’s gospel states here very clearly that the kind of power exercised by the kingdoms of the world is not God-given power but rather demonic power, power in opposition to God. Luke doesn’t single out specific kinds of kingdoms, but seems to be including all kingdoms—all large-scale organized political, military, religious and economic power no matter their differences or even if they are in opposition to one another—as deriving their power from that which is opposed to God. Such a statement flies in the face of any claim by any empire—be it Babylonian or Roman or American—to being blessed and sanctioned by God. To all of these, Jesus—and purportedly any who would follow him—says no, equating the exercise of such power with the worship and service of that which is not God. Following the third and final temptation, which Jesus also declines, the devil departs, apparently awaiting another opportunity. Jesus, after being chosen by God, has demonstrated his faithfulness in contrast to the repeated stumblings and failings of God’s chosen people the Israelites following the Exodus. Jesus has revealed too what it means to be “God’s beloved”—to resist the lure of using power to satisfy one’s self; to not mistake the organized power exercised by “kingdoms” of this time (or any time) as being blessed and sanctioned by God, to be properly suspicious of invitations to participate in that power (even if one believes that one could do good), since the source of that power is not God; and to be wary of religions, as in the final temptation, for it has no special exemption from being manipulated to serve the will of those opposed to God (indeed, even the devil can quote Scripture to suit his purposes, see verses 10-11). This coming Wednesday, February 20th, at 7:30pm, we’ll be looking at Luke 9:28-36. Feel free to come and join us. At the end of chapter three of Matthew’s gospel, Jesus (and us as readers) hears the voice of God proclaim, “This is my beloved son, with whom I am well pleased.” This proclamation sets the scene for what happens in chapter 4. Following his encounter at the Jordan with John, Jesus retreats to a place by himself, left to figure out what this means, this proclamation that he is the beloved son of God. In some sense, Jesus’s retreat to the wilderness calls to mind the Native American idea of a “vision quest,” a turning point in one’s life where a young man figures out whom he really is and what that means. So we have Jesus, at the beginning of chapter four, fasting and alone in the desert, possibly unpacking what has just happened in his encounter with John. The eleven verses that make up the “temptation” passage are rife with Exodus imagery. Jesus being led into the desert where he spends 40 days and 40 nights fasting should recall to us the story of Israel, a people freed from Egypt and led by the spirit into the desert for a time of testing that lasts 40 years. But whereas Jesus’s ancestors spent their time in the desert complaining about there not being enough food or drink (and God answering with manna and flowing water from the rock), fashioning a golden calf and worshipping it instead of God, and so on, Jesus will meet the challenge of his testing. The Israelites are tested and falter time and time again during their 40 years, but Jesus will recapitulate their time in the desert with his 40 days—but he will meet the tests and remain faithful to God. The devil starts the questioning of Jesus with an interesting conditional phrase: “IF you are the Son of God…” This phrase is attached to the proclamation at the end of chapter 3, connecting the two passages, and hinting to us that the very thing which Jesus was contemplating while in the desert was indeed what happened in the Jordan with John and what does it mean. And the devil has some easy ways for him to unequivocally answer the question of his identity. “IF you are the son of God…” well, then, do this and you’ll know for sure. Right? But Jesus doesn’t take the bait, recalling instead the words from Deuteronomy, words that again recall the manna passage and the Israelites own crying out for God to give them something to eat. In the second temptation, the devil evokes in Jesus a powerful emotion—fear. He perches Jesus on the top of the temple and again suggests that a way of being sure about his identity is to throw himself off, even quoting scripture (the devil can quote scripture too!) as to how the scenario should unfold. But Jesus resists again, quoting Deuteronomy. The final temptation offers us some interesting political analysis. The insinuation in verses 8-9 is that the kingdoms of the world belong not to God, but to the devil—they’re his to give. These verses should cause all of us to be skeptical of aligning any kingdom, any political ideology, any economic empire, any nation or state, with the kingdom of God. The kingdom of God is not equivalent to any political reality we might find here on earth. And no matter what good we think we might be able to do by wielding the power that comes along with positions of status and influence within such systems, we would do well to remember Jesus’ refusal to make any deals with the devil to be the master of such power (again by quoting Deuteronomy). Whereas the Israelites time of testing and preparation as the chosen people of God was a series of failures and mistakes, Jesus realizes his identity as God’s chosen son by meeting each challenge and remaining faithful. SCRIPTURE STUDY: We interrupt “Silent Night, Holy Night” with an emergency alert – DANGER! Our visions of Christ’s birth—Nativity scenes, shepherds, the manger, the angels—are shaped primarily by Luke’s gospel. The mood reflected in Christmas hymns—“Silent night, holy night, all is calm, all is bright…”—owe much to the Lucan narrative. But the circumstances of Jesus’s birth in Matthew’s gospel are another story. All is not calm, bright, peaceful or tranquil. From the episode of Joseph finding Mary pregnant—with a child not his own—and his decision to quietly divorce here rather than face the law (death by stoning for an adulteress) on through the moment they flee Bethlehem for Egypt because of King Herod’s massacre of all boys two years and under, Matthew’s Christmas story is one fraught with danger and desperation. In starting with chapter 2, we’re introduced to two primary characters (we’re counting the magi as one character since they are not singly distinguished from one another in anyway) in the Matthew birth narrative. While it is often debated as to what exactly “magi” are (astrologers, kings, wise men, etc. ), the important characteristic of the magi in Matthew’s gospel is that they are “non-Jews,” they are Gentiles, foreigners, travelers from afar. The magi are juxtaposed with King Herod, i.e. the actual “king of the Jews”, and, to a lesser extent, the chief priests and scribes of the Judean people. It is the differences in action and orientation between these two primary characters that drives most of the plot in the verses that immediately follow. The magi will be the first people to recognize and honor the significance of Jesus when they find him in the house in Bethlehem (no manger or stable in this story). They are “outsiders,” with no special knowledge of God outside the notice of a new star; while King Herod, the chief priests and the scribes are “insiders,” a people who possess special knowledge, the ones who know the prophets and the words of Scripture, directly descended from Abraham and Moses, bearers of God’s revelation, God’s chosen people. It is the outsiders who see and know and act in accordance with the new action God is taking in history, while the insiders are blind and ignorant and concerned primarily with their own power and any threat to that power. There is an interesting line too in verse 3, “King Herod was greatly troubled and all Jerusalem with him” at the appearance of the magi and there words about a new king being born. We remember that Judea is occupied by the Romans and that Herod serves as a client-king, a puppet-dictator whose real power only lies in his accommodation to and willingness to serve the interests of the Romans over and against the needs of his own people. We can see throughout history how it is that “the people” become troubled whenever their local dictator is troubled: the anxiety of the dictator usually ends up being acted our through greater oppression and violence against the people over whom he rules. Once the magi depart, without of course reporting back to Herod, we see what it will mean for the people to suffer because of Herod being troubled. As people in power so often act when faced with a threat to that power—remember that the magi came asking about the birth of the king of the Jews—Herod will unleash death and destruction on innocent, common people in order to quell any threat. His charge is to kill all the male infants and toddlers in the vicinity of Bethlehem. So, far from that silent night, holy night and choirs of angels singing “Glory to God in the highest and on earth, peace to all people”, Joseph is forced to flee the wrath of Herod—who at this point is cast as that most evil of characters in one of the most tragic events in Hebrew history, Pharaoh and his campaign of ethnic cleansing, ordering the killing of all Hebrew slaves’ newborn baby boys (Exodus 1). Joseph flees his home (note that Mary and Joseph actually live in Bethlehem at this point, not Nazareth), with wife and newborn child, to Egypt. The Holy Family become refugees, fleeing the political violence of their homeland. The story will ultimately bring Mary, Joseph and Jesus full circle, returning once the threat has passed, but not to Bethlehem, for fear of further repercussions from Herod’s son who now rules in his place, but rather to Nazareth, a no-name town (not mentioned in the Old Testament) on the margins of the nation. In his story, Matthew has cast upon Jesus parallels both to the Hebrew people themselves and the story of the Exodus, as well as Moses and the story of his own dangerous, extraordinary birth. So we see many possibilities for what Matthew may want to share with us: the conflicting parts that will be played by outsiders and insiders, a revelation that is understood by those without special knowledge but missed by those who possess that knowledge and should know better, the opposition of those with power to what God is trying to do in the world, the marginal status of Jesus and his family—in particular as refugees or immigrants—and their identification with one of the “protected” peoples of Jewish law (foreigners/refugees from “widows, orphans, and foreigners/refugees”), and the identification of Jesus also with Moses and the whole history of the Hebrew people. For Scripture study this semester at the house, we’re looking at the gospel of Matthew. We started last week with what has to be one of the most boring passages in all of scripture: the opening verses of Matthew, i.e. the genealogy of Jesus. But look a little closer and a few things stand out which might be clues for what Matthew has in store for us. The genealogy is split up into 3 sets of 14 generations, going back to Abraham, then through David and ending with Jesus. The tracing Jesus’s line back to Abraham, Isaac and Jacob seems pretty clear: Matthew is attaching Jesus to the founding fathers of the Hebrew people. The tracing the genealogy through David is also pretty clear: David is the “messiah” template in Judaism and by the end of the genealogy, Matthew has claimed that title for Jesus. Following David is a who’s who of Hebrew kings, good and bad, all the way to the biggest event in Israel’s history since the flight from Egypt—the Babylonian exile. The Babylonian exile marks a break in the Davidic line; the names of kings, familiar from scripture, gradually gives way to generations of anonymity, a downward progression of the Davidic line which results finally in Joseph, a carpenter. And here is where it gets interesting. While Matthew begins his story by tracing Jesus’s lineage all the way back to David and Abraham, were left with what appears to be a disruption, a break in the line when we get to Jesus. Jesus is born of Mary, wife to Joseph, who is the adoptive father of Jesus according to the text, not his actual father. The birth of Jesus, which Mathew seems to be presenting to us as a continuation of the story which goes back to Abraham, is actually discontinuity. Matthew’s genealogy makes the case for both continuity and discontinuity in the birth of Jesus. We have an old story and a new story here, and how they play off of each other may be some of what Matthew has in mind for us in the rest of the gospel. One other point to mention is the unusual asides mentioning women in the genealogy. Besides the fact that naming women in a genealogy of this kind is atypical, the particular women mentioned all have something in common—namely their status as outsiders. They are “non-Jews” who marry into the tribe and end up playing some decisive role within the story of God’s chosen people. Another inference from Matthew meant to draw our eyes to the interplay between insiders and outsiders? And the roles they play in God’s unfolding plan? We’ll continue reading on, each Monday, from 12-1pm. Feel free bring a lunch. All are welcome. Earlier this morning, I had a lot of fun talking with a group of about 100 or so parishioners at Holy Faith Catholic Church about “Scripture as Story.” For the folks who were there, I mentioned that I would make sure that I made it easy to find a link to my short general overview to our approach at studying Scripture at the GCW. If you want to read that short overview which includes a little bit about the power of story and a concise list of things to consider as you study Scripture, click here. Additionally, I had to leave out one section of the talk this morning in the interest of time. I’ve pasted below a version of that section in case you’re interested. Thanks! In essence, this is Brueggemann’s fancy way of saying that for the great majority of folks in our churches, we have in fact (perhaps unwittingly) chosen to worship other gods than God, and to build our lives around other stories than the stories of our Scripture. Call those gods what you will: status, money, success, political ideologies, and so on. And those gods are mediated to us by their own priests, whether it be the folks who weave stories for us from Madison Avenue, or Wall Street, or from the media, or from political parties… They understand how to tell us stories which capture our allegiance, and we end up giving our worship to these false gods and organizing our lives based on what they have told us is important, essential, necessary to our fulfillment and happiness. The one false religion Brueggemann names in particular, “consumerism,” is rampant in our culture. Brueggemann goes on to call consumerism “an ethos that depreciates memory” (meaning it cultivates in its adherents ignorance and disregard for the past), and that it “ridicules hope” (meaning that it encourages a lack of care or consideration of the future). What it tells us is that all that matters is now, and me, and what’s mine. What he asserts is that we have lost our stories, and with it, we have lost our memory of what truly matters, of who we truly are, and what our purpose is here on this earth. And until we re-remember those stories, until we start to let them get inside us and work on us and recapture our allegiance to the real God, we will remain defenseless against the snares and lures of the false idols prevalent in our culture. We will remain prone and vulnerable to the manipulation of stories which purport to offer us happiness or fulfillment when what they really offer is our enslavement. Our scriptural stories offer us a different Word than the dominant stories of the culture in which we live. Our scriptures serve as a counter, reminding us who we are and who God is and what our relationship is to each other and God. More often than not, they go against what passes for conventional wisdom; indeed they are often critical of conventional wisdom. Like our ancestors in the early church, our scriptures invite us to be “different” — the Bible uses a word that is often translated as “peculiar” — in the world. Soren Kierkegaard, the great 18th century Christian philosopher once wrote: “There was a time when one could almost be afraid to call himself a disciple of Christ, because it meant so much. Now one can do it with complete ease, because it means nothing at all.” Even 200 years ago, Kierkegaard was recognizing that people who follow Christ had ceased to look different in the world, that they looked, talked and led their lives just like everyone else–that they were no longer witnesses to a different reality but rather accommodated to the culture in which they found themselves. 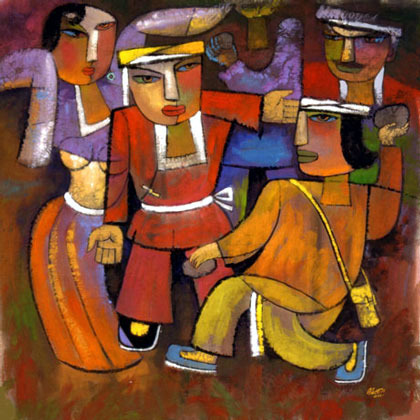 In verse 29, as the passage opens, Jesus is moving from the synagogue–a public, sacred space and the domain of the scribes, elders, et al–to a more private, intimate space–the house of Simon and Andrew. The shift in scene takes Jesus from a place of tension and conflict (in the passage just prior, Jesus was confronted by demons and the people openly privileged Jesus’ teaching over the teaching of their professional religious leaders) to a more relaxed, comfortable setting. Upon entering the home, Jesus is told that Simon’s mother-in-law in sick. This verse has a few clues for us to consider. One, Jesus has not demonstrated his power to heal up to this point in Mark’s gospel (the earlier passage is an exorcism, distinct from healing), so to assume that Simon or Andrew bring up her sickness as a request for Jesus to heal her seems a little bit of a stretch. One person this week suggested that maybe the assertion that the mother-in-law is sick with a fever functions more as a warning to Jesus, i.e. Jesus should steer clear of her. The second consideration is the status of Simon’s mother-in-law. Since she’s living with Simon and her daughter’s family, we can assume that she has no husband to care for her. As a widow then, she fits into that specifically Jewish list of those who are consistently the most marginalized and vulnerable in society–the widow, the orphan and the stranger/foreigner/immigrant. So when Jesus touches her in verse 31–even though he has been warned to stay away, and even though she is a widow, i.e. a person of no account–it seems to be less about any miraculous healing and more about Jesus’ preferential option to see those who are typically rendered invisible, touch those who are typically deemed untouchable, take account of those who are typically considered of no account. Even the muted nature of the miracle–she’s in bed with a fever, not blind or lame–asks us to look elsewhere for deeper significance in the action. The passage asks us to consider how much sickness is intertwined with the feelings of being discarded, ignored, or uncared for by others, as much as it is about the actual physical discomfort. Jesus has not allowed the people’s astonishment or amazement toward him [verses 21-28] to inflate his own sense of self-importance that he would dismiss the sickness and loneliness of this silent widow. Finally, we should also note that the Greek word interpreted here to say that the widow then “waited on” Jesus and his disciples is the same Greek word used later in Mark that is specific to the “service” that is associated with discipleship (see 15:41). The work of seeing to another’s need is recognized as an authentic exercise of discipleship, not devalued as “unimportant” work to be done by those of lesser status. The next passage opens by noting that the Sabbath has ended (“after sunset”) and that a large number of people were being brought by their friends, families and others to the door of the hosue where Jesus was staying. The people being brought before Jesus are identified as “ill or possessed by demons.” So what does this identification mean? Historically, these stories are circulating probably around the time leading up to the Roman-Jewish war of 66-70 AD. It is a time of increasing political and economic instability, helping to lay the foundation for the short-lived success of Jewish zealots and others who are able to temporarily drive the Romans out. In times of political and economic distress, the ranks of the poor swell with those who once were able to get by losing what little they had and those who had next to nothing to begin with reaching an even more severe level of destitution and desperation. For the increasing number of poor, to be sick meant much more than to be physically disabled. There are also emotional, psychological and spiritual dimensions to poverty, similar to what we saw with Simon’s mother-in-law. But we also know that illness holds more devastating consequences for the impoverished than for people of means and status. First, the poor are more likely to get sick and to stay sick. This is directly related to their access to healthcare, their ability to pay for medicines, their lack of access to those things which lead to good health (healthy foods, clean living conditions, networks of social support) and the likelihood of lifestyles or jobs (lack of a home, hard or dirty manual labor) which expose them to greater risk of sickness. But sickness has social and cultural, and certainly in Jesus’ time, religious dimensions as well. To be sick was to be in a “socially devalued state.” Sickness was a symptom of sinfulness, of ritual impurity, and it meant being excluded from worship, from one’s social networks, and in extreme cases, from one’s community or town. Besides suffering from an inability to access or pay for cures for the physical symptoms of an illness, the sick also could only return to worship and their various social units upon making atonement for their ritual impurity or sinfulness–which meant also having the economic means to satisfy the prescriptions of the sacrificial system which was administered by the priesthood or their proxies. The business of sickness (and at that time, ritual impurity) was big business, as it is now. And such a system put undue and sometimes impossible strain on the poor. In summary then, those who are coming to Jesus in verse 32 are most likely overwhelmingly the poor and destititute sick, those whose physical condition have marginalized them socially, politically, economically, religiously and culturally as well. The ways to physical healing and social health have all been closed to them. They do not have recourse to the systems built and maintained by people of status, means, and power. What Jesus then represents to them is so much more than the simple curing of their physical symptoms. Yes, we can acknowledge a physical dimension to these stories of Jesus’ healing; but so much more than that is taking place. The act of healing includes the possibility of restoration to the community, the reopening of relationships, a chance at a new life, the ability to work and to worship, and the reclaiming of dignity. There is a social dimension to these acts of healings that we miss entirely if we narrowly attune our eyes to the “miracle” of a blind man seeing, or a deaf woman hearing. The passage ends on an ominous note. Referring back to verses 21-28, Mark now makes clear what was murky. The religious institutions of Jesus’ time have become possessed, no longer serving God or the needs of the people, but rather serving a corrupt and demonic power (greed? wealth? power? the market? nation? empire?) So Jesus embarks on a campaign, preaching and driving out the demons which have taken up residence in these places of worship and education and in the people who run them. His campaign is from synagogue to synagogue, liberating each of them, throughout all of Galilee. Next week, we’ll look at the last passage from this opening chapter in Mark, 1:40-45. Feel free to join us anytime! I’ll also be posting regular reflections after each scripture study if you want to check them out here on the website.